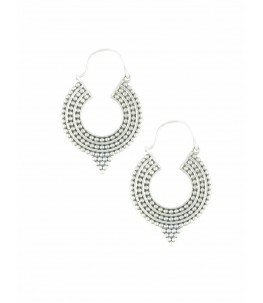 Bali earrings are quintessentially the Indian name for Hoop earrings. They are a minimal version of the ever so popular Chandbali Earrings. Balis are essentially lightweight with beautiful traditional or contemporary motifs, and Sterling Silver Balis make for great everyday wear, as well as evening wear. Silver Balis come in various forms – they could be simple silver hoop balis for day-to-day wear, or lovely jhumka balis which have a tiny silver jhumki hanging from the silver bali. For festive occasions, kundan balis are a great option, as are our Crescent Floral Bali Earrings, which are beautiful gold plated balis with floral motifs. 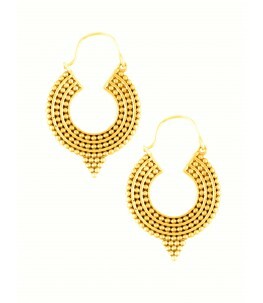 With designs influenced from Jaipur, these moon-shaped earrings look spectacular with everything! Buy Sterling Silver Bali Earrings online, only at Ahilya!